Fear by European countries, Airbus and many airlines, that loss of sales of Airbus planes to China was a reason for “stopping the clock” for a year, on aviation’s inclusion in the ETS. Now a deal has been agreed that China will buy 18 A330s from Airbus. Now inclusion of aviation in the ETS has been emasculated, Airbus is keen to sell as many planes as it can to China and returning to what it calls ‘business as usual’. The order that has now been announced is part of an earlier order for 45 wide-body jets, which are worth about $4n at list prices, although China may get a hefty discount on them. There is also an order by the Chinese for 42 A320 narrow-body jets, worth about $3.8bn though this deal had not been affected by the ETS debacle. Airbus, which is a subsidiary of EADS, hopes China will be its largest customer during coming 2 decades, buying large numbers of planes. France, Germany and Britain continue to do all they can to build strong commercial ties with China, to boost exports and income. China has agreed to buy 60 planes from European firm Airbus, in a deal worth $8bn (£5.2bn) at list prices. It is the first such deal since the European Union suspended the inclusion of foreign airlines in its controversial Emissions Trading Scheme. China had voiced its opposition to the scheme, which charges airlines for the carbon they emit. Last year, Airbus had alleged that China blocked firms from purchasing its planes amid the row over the scheme. 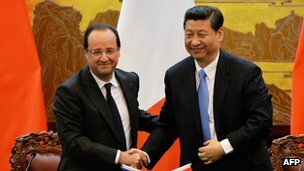 The deal was signed as part of a series of agreements during French President Francois Hollande’s two-day visit to China. It includes an order for 42 Airbus A320 aircraft and 18 A330 planes. The European Union’s plans to introduce the Emissions Trading Scheme (ETS) have been met with a lot of opposition. The scheme creates permits for carbon emissions. Once an airline exceed its allowance, it has to pay to buy extra permits. The number of permits is also reduced over time, so that the total CO2 output from airlines in European airspace falls. The supporters of the scheme say that it acts as an incentive for airlines to pollute less. However, more than two dozen countries, including China, Russia and the US, have opposed the move, saying it violates international law. Under pressure from these countries, the European authorities agreed in November to suspend the inclusion of foreign carriers in the scheme for one year. Fabrice Bregier, chief executive of Airbus, was quoted by the Financial Times as saying that the “agreement shows that China recognises the efforts that Airbus and the EU have made to resolve the [emissions trading scheme] issue and is a step towards ‘business as usual'”. ……. Toulouse-based Airbus announced that China had signed an agreement to buy 18 A330 wide-body jets as François Hollande, France’s president, started an official visit to China. ……..Mr Hollande also wants more Chinese companies to invest in France to help tackle rising unemployment. The EU’s decision to ‘stop the clock’ on including emissions from intercontinental flights in its Emissions Trading Scheme appears to have been influenced by Chinese threats to cancel orders for new planes from Airbus. A letter from the president of the French aircraft maker to China’s leading aviation official – seen by Reuters – says Airbus played an influential role in persuading the EU to give the world’s governments another year to reach agreement on how to tackle carbon emissions from air transport. T&E says European governments have effectively given China ‘a veto over European policy’. Airbus tries to get inclusion of aviation in ETS suspended. EU confirms no change. Posted: Saturday, April 27th, 2013. Filed in General News.